One handed clamp that works through a ratchet handle similar to a caulking gun. All steel prescision clamps used by metal fabricators. Above is a miscellaneous group of clamps suitable for carpentry and joinery work and general construction. A hand clamp that uses lengths of threaded rod. An engineer's "C" clamp, also known as a "G" clamp. A home made type of "F" clamp. Well; I have a confession to make. After 50 years in the building and construction game I have never used one of these easy clamps! 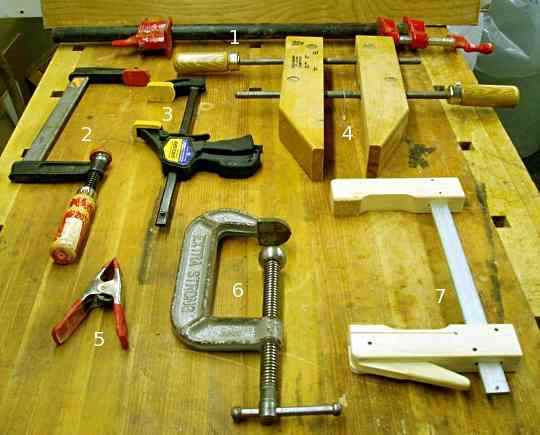 I have seen many in various joinery shops that I have visited in recent times and I have seen plenty of them in young tradies tool kits, and the all swore by them. Unfortunately they were not available here in Australia when I could have used them with a vengeance. And I most certainly would have used them. The fact that these can be operated by one hand, while holding the material in the other is a complete winner. Many manufacturers make them and they range from 6" to 36". They work on the same principal as a caulking gun. One squeeze of the handle moves the jaws a fraction closer and they are held by a ratchet.